Gilder Lehrman Collection #: GLC00715.10 Author/Creator: Semmes, Emily J. (fl. 1862-1863) Place Written: Opelika, Alabama Type: Autograph letter signed Date: 1 June 1863 Pagination: 4 p. ; 20 x 13 cm. 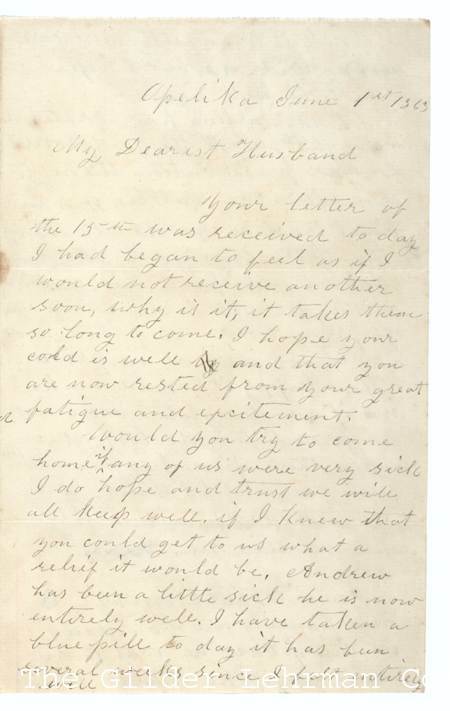 Summary of Content: Writes to her "dearest husband" as he is on his way to Gettysburg, Pennsylvania, where he was mortally wounded in battle. Hopes that he is over his cold and fatigue. Asks if he would be able to come home if one of the family got sick because knowing this would put her at ease. Gives thanks that he made it through battles. Comments on their children and their schooling. Criticizes their daughters for their excessive pride, "...they do look down upon these poor people with such contempt I think it is so wicked I pray that they may see their sin." States that she has been very frugal, they have enough supplies and the garden is doing well. Includes a postcript instructing Semmes to "Destroy this as soon as you read it."